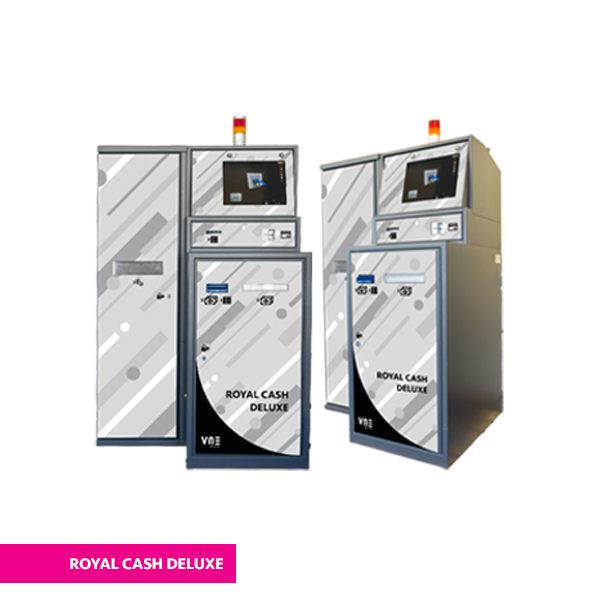 Medium capacity VLT Ticket change and Change Machine with coin and note recycler based on PC platform. 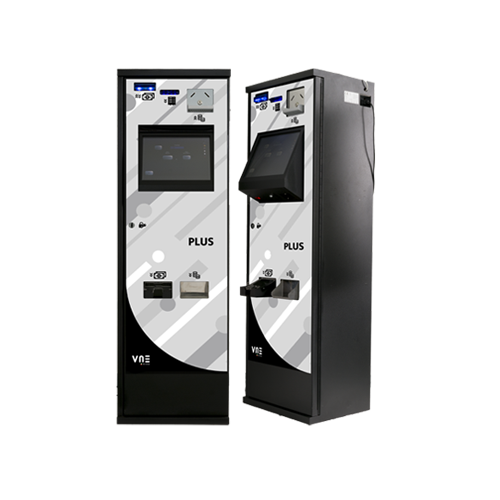 In the DELUXE model, the machine handles VLT ticket payments and two way banknote/coin change. 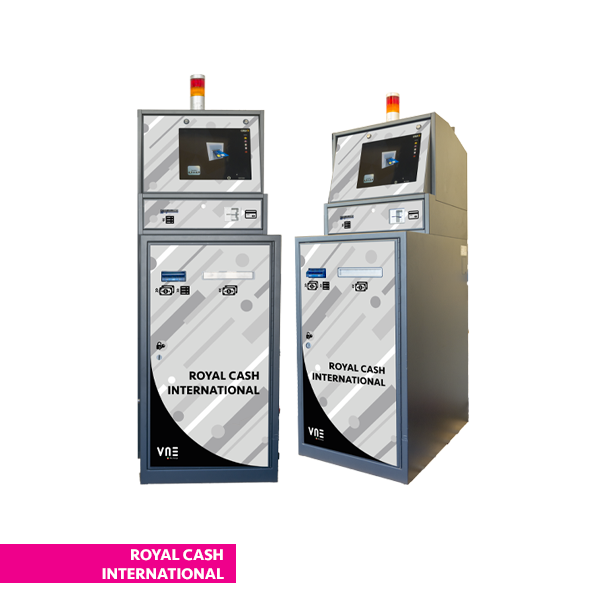 Fitted with a dual denomination banknote recycler and a system for inserting coins via a convenient tray, it accepts, validates and sorts coins into three high capacity belt driven hoppers. Coins that are not programmed for the hoppers are rejected automatically whilst the others are channelled to re-fill the hoppers used for dispensing. The machine accepts all banknotes and the two programmed denominations re-load the two drawers in the recycler whilst the others are placed in the stacker together with the VLT tickets. 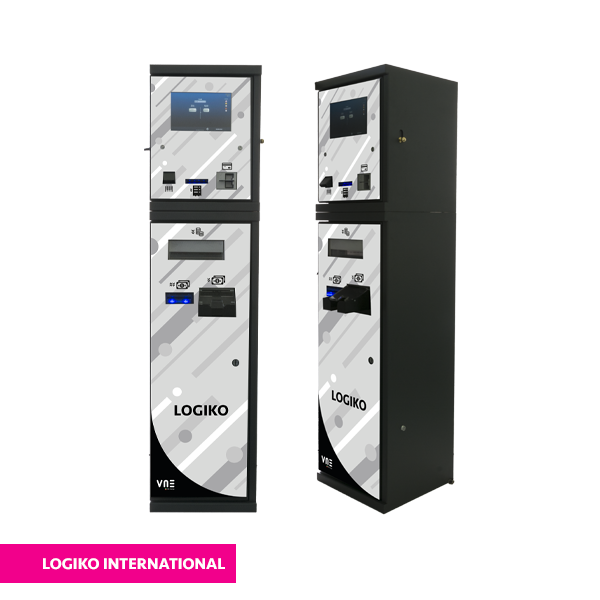 Re-filling the hoppers from the coins inserted and from recycling two banknote denominations ensures that only a small starting stock of change is needed when installing the machine guaranteeing an incredibly efficient performance. The machine operates 3 single denomination or multi denomination hoppers, including combinations which enable tickets to be paid in the exact amount down to the last cent and in order to support the banknote recycler the machine has a note dispenser which is able to dispense up to 5 different note denominations with a total capacity of around 2500 pieces. 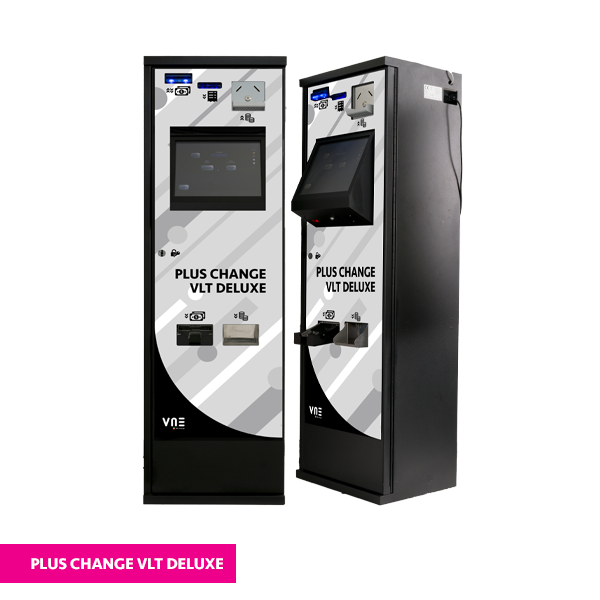 A winning ticket must be provisionally validated in the dealership system and then inserted and validated in the Plus Change Vlt system via a highly professional scanner. Once the winning amount, via the operation described, has been unequivocally matched to the barcode, the original ticket is inserted into the machine which will in turn pay out the winnings only once. The machine is also equipped with a bill breaker function and can therefore take big notes to change into smaller notes or coins. 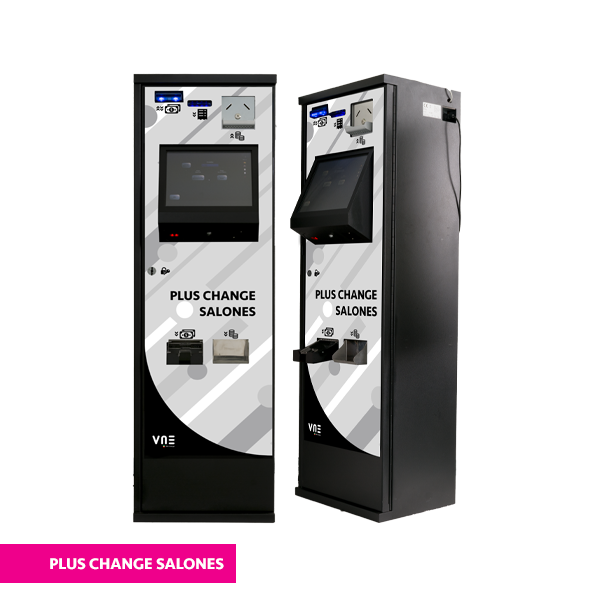 The change denominations can be chosen by users with a convenient 15″ Touch screen which makes transactions simple and intuitive. If winnings exceed the limit accorded by law as an anti-money laundering measure, the machine does not allow cash payment transactions. In this case the machine is able to use an attached device which can dispense cheques for the amount needed via checks and authorisation on recognition of an authorised operator badge. Opening the main door is controlled electronically and can only be activated on recognition of an authorised personnel badge and can also include a time delay as an extra anti-theft security measure. Access to the menu can also only be authorised on recognition of operators and various levels of access and functions can be set. In addition operator badges can be used as a card that can be loaded with a capped amount of money that the authorised operator can then be dispensed from the machine. The machine can be connected online via ADSL and can be managed and controlled remotely through a website or an extremely easy to use App. 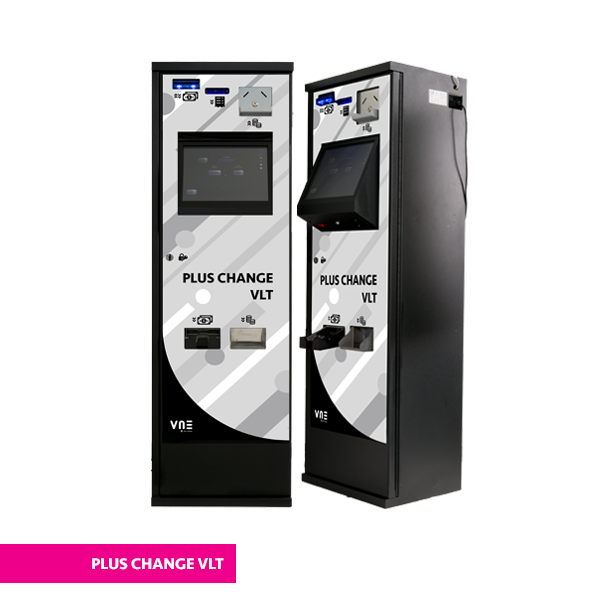 Plus Change DELUXE has a classic design which is especially designed with consideration given to ergonomic heights for inserting and dispensing money. Its plexiglass cover on the front door panel can be customised with various colours and logos.